Photos and information are based on a booklet researched and compiled by Lorne Pearson for the Surrey Professional Fire Fighters' Pioneer Association. The first fire brigade in Surrey was located at Surrey Centre and was operational in 1898. Here is an excerpt from THE DAILY COLUMBIAN NEWSPAPER, May 3, 1898, attesting to that fact. Fighting Fire at Surrey Centre Great excitement was caused at Surrey Centre, Sunday afternoon, by an alarm of fire, caused by sparks supposed to have blown from the Chinese shack on Coast Meridian Road. The flames spread with great fierceness, helped along with a brisk wind which was blowing. Mr. A. Richardson's property stood in great danger for quite a time. Fences, logs, and a great amount of rubbish lying around blazed merrily for a long time. Neighbours and all persons in the vicinity, along with the boys, worked like Trojans, and gained a noble victory, after a most terrible fight. Churchland's farm and outbuildings luckily escaped. Fences were torn down to stay the rush of the fire fiend. Water was thrown on the flames by Surrey Centre fire brigade, (long may they live!) from two powerful spray pumps. This was the earliest fire equipment known to be used in Surrey. They were two powerful spray pumps. It is not known if these were on a vehicle, wagon, trailer, or carried by hand. No other information has been found defining the existence of such a community service until 1928, when the Cloverdale area instituted their volunteer fire brigade and therefore this is generally considered the functional focal point for the beginning of Surrey's Fire Department. The following information was published in the Surrey Gazette Newspaper and recorded in the Cloverdale Volunteer Fire Brigade Minutes. Friday, November 2nd 1928. The business section of Cloverdale was threatened with destruction by a spectacular fire, which burned the rooming house and restaurant owned by Albert Fournier, as well as a frame building owned by Max Kovis of New Westminster, early this morning. Both the structures destroyed, fronted onto Pacific Highway(Hwy 15) at the north end of town. The Kovis building was divided into store premises that were occupied by: Mrs. J. M. Richardson, who operated a variety store; Mr. J. A. Ross, a plumber; and Mr. W. M. Goodlet, a shoe repairer. Each of these business people lost all their stock. Practically all the contents in the rooming house and restaurant were saved by the rooming house occupants and others who turned out to fight the inferno, they carried those contents outside. Even at that, the total loss was estimated at $1,000. Fortunately a substantial amount of the loss was covered by insurance. The cause of the fire which broke out in the Kovis block, was not determined. The flames were first discovered by Mrs. Richardson in a dwelling adjoining the Kovis building, at 3:00 a.m. Word of the fire quickly spread throughout Cloverdale and within a very short time a great many of the town's residents were on the scene, looking to help save whatever could be removed from the premises which were threatened by the flames. The fire had obtained a secure hold on the Kovis building by the time it was discovered by Mrs. Richardson, who made a call to New Westminster and Vancouver Fire Departments for assistance. However, the fire departments in both cities declined to respond. An appeal was then made to the Blaine, Washington Volunteer Fire Department. About fifteen minutes after the call for help, Blaine fire fighters were on the scene with their chemical fire fighting equipment, and it was largely due to their efforts that the loss was not more extensive. The Highway Garage, operated by Charles D. Hamre, was adjacent the site of the Fournier Building, and immediately across Pacific Highway were the storage tanks and a warehouse of Imperial Oil. Volunteers from Cloverdale succeeded in saving both these structures although the roof and side of Hamre's garage were scorched. The rooming house contained ten rooms, which were all occupied at the time of the fire. It was also home of a large restaurant. Mr. J. L. Griffiths, of Cloverdale Motors Ltd., was one of the rooming house tenants. He was awakened by the reflection of flames through his window and he aroused other occupants. The lodgers had ample time to dress and gather their belongings before the spread of flames to their abode and so they began removing furniture, which was always the first chore in areas without fire protection. 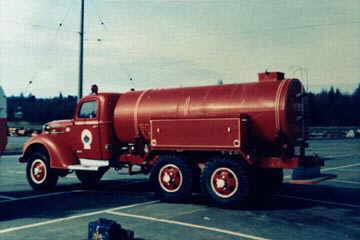 The next morning, residents of Cloverdale were generous with their praise of Blaine fire fighters, for saving the business section of town, but expressed great surprise and disappointment over the failure of New Westminster and Vancouver Fire Departments to send a chemical wagon manned with experienced fire fighters. The unanimous decision at a public meeting of businessmen and other residents of the community was that Fire fighting equipment, for the protection of Cloverdale and surrounding district, should be acquired as soon as possible. The meeting was held in the Municipal Hall on Monday, November 25, 1928. This meeting was one of several arranged by the Surrey Board of Trade, following the fire at the Fournier and Kovis buildings. The purpose of these meetings was to discuss ways and means of obtaining equipment to provide some protection against loss by fire in the future. The equipment proposed was a chemical wagon fitted with two tanks of fifty gallons each and that could be towed by an automobile or truck, to any fire that might break out. It was to be manned by a volunteer brigade. The estimated cost of this equipment was about $900, but efforts were made to raise $1,100, the extra $200 to be presented to Blaine, Washington Volunteer Fire Brigade for their efforts and valuable service given to Cloverdale on November 2nd. A committee was created to raise $1,100, subscriptions were solicited from all the merchants and residents located within an approximate radius of one mile, from the corner of New McLellan Road and Pacific Highway. $25 was collected from each businessman and $7 from each resident, as an assessment calculated to raise the required money. With the arrival in early December 1928 of chemical tanks and a hose reel, Cloverdale was soon to have a fire department. The tanks and hose reel were made for use on a horse-drawn vehicle and were obtained from the City of Vancouver, which with the advent of motorized apparatus had no use for the equipment and therefore loaned it to Cloverdale, free of charge, for an indefinite period of time. The equipment was in first class condition, but money was required to make necessary changes to bring it up–to–date. There were two tanks of forty gallon capacity each, and in addition a hose reel and some extension ladders. Credit for obtaining the equipment from Vancouver belonged to Mr. A. J. Christmas and Mr. H. V. Parr, who negotiated with the Vancouver authorities. The Chemical Wagons used in 1928 contained two tanks (40 gallons each) stationary mounted on the vehicle, and also a reel of 2 inch hard rubber fire hose. When the water and bicarbonate of soda in the tanks was mixed with sulphuric acid, carbon dioxide gas was generated, building up pressure in the chemical tanks and thereby expelling water under pressure. These early chemical wagons were most always soda-acid and not foam type units. Memories of Hall's Prairie; an elementary school cook book: The Fire! Bernice (Barton) Howard-Gibbons, Student 1936-1944. Bill Lawrence was a member of the Volunteer Fire Department. Accordingly, when the call came they sprang to action and set off for Hall's Prairie School; the fire truck towing behind it a large water tank. This was necessary in those days as there was often no nearby supply of water. Riding astride the water tank was Bill. The fire truck, traveling full speed ahead, hadn't gone very far down the road when the water tank came unhooked. The tank continued on its own, careening along the highway. Bill quickly sized up the situation and decided his chances would be better if he and the tank parted company. Bill jumped off, sliding on the seat of his pants for some distance along the icy road; the tank crashed into the ditch! The fire truck never did get to the school, and, no other water being available, Hall's Prairie School burned down. Within a few years this equipment was removed from its carriage and installed on a Buick automobile chassis. On February 12, 1929, a meeting was held to form a volunteer fire brigade and the first Volunteer Fire Chief elected for Cloverdale was Charles Hamre, who owned the Highway Garage situated next to the conflagration of November 2nd 1928. The newly created equipment was housed at Hamre's garage and an air horn was mounted atop the garage as a alarm device to summon volunteer fire fighters. The second Volunteer Fire Chief of Cloverdale Volunteer Fire Brigade was Charles' brother Ed Hamre who took over when Charles died. The third Volunteer Fire Chief of the Cloverdale Volunteer Fire Brigade was Bruno Zappone. Today, (2005) Bruno still lives in Cloverdale and remains active in many community affairs. In 2004, Bruno received the Queen's 50th Anniversary Medal for his many contributions to the City of Surrey. The next fire brigade to be established in Surrey was the White Rock Volunteer Fire Brigade. The White Rock area had many disastrous fires in the early 1900s, but had no practical fire fighting resources until 1934. Nevertheless, they did have fire protection supplied by Blaine, New Westminster and Cloverdale. 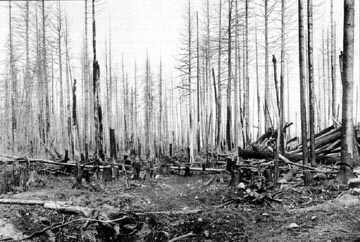 One fire of note was a Wild land fire in September 1910, which burned from the east end of the White Rock area through to Blackie's Spit, a distance of more than 6 miles. Eight homes owned by the Hazelmere Lumber Company, a number of summer homes and some businesses were all devoured by the flames. The British Columbian; September 20, 1910. The fire is one which has been smouldering since August 2, and the hot weather and winds of the past two days have served to fan the blaze into an immense size. The fire now extends from White Rock to Blackie Spit about six miles north and the whole countryside is one mass of flames. In January 1927, fire destroyed buildings along sea front road. Some of the premises destroyed and damaged were; the Pavilion, Auditorium, Clancy Building, Post Office, J. D. MacMillan and Fred Philps buildings. Damaged were Shepherd Brother's Meat Market (operated by Ben and Len Shepherd), and Dinty Moore's Confectionary. This fire became the central point in establishing a volunteer fire brigade for the White Rock area. An interesting fire occurred in 1928 at the Great Northern Railway Station Depot on the sea front road. William R. Barge supplied buckets from his hardware store to facilitate a bucket brigade in passing water from Semiahmoo Bay to the train station fire, an action that saved the building. Finally in 1933, after years of talking, a committee of three; Messrs. W. J. Moffat, W. J. McIlwain and Councilor Logan Davis, was established to muster a group of volunteers to form the White Rock Fire Brigade. W. J. McIlwain was appointed first Deputy and first driver, until the group became structurally sound and selected a Chief. 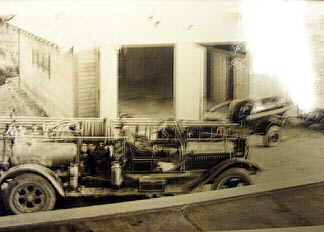 The newly created group responded to their first fire in March 1934. It was a bush fire on Buena Vista Avenue that threatened some homes. It was reported that the bucket brigade saved a lot of valuable property. Organization of the newly formed volunteer group was lacking. This obstacle soon came under control when retired Fire Chief W. J. Watson of the New Westminster Fire Department and summer resident of the White Rock area, was appointed Fire Marshall in 1934. Fund raising events took place and in 1936 a reorganization meeting was held. W.J. McIlwain was elected Chief. McIlwain soon moved to the interior of BC and the fire brigade faltered for some time under various Chiefs, along with the burden of inadequate equipment, and lacking other essential operational items. Jack Kelman was one of White Rock's first active fire men. The first piece of equipment was housed in Kelman's Garage at the corner of Washington Avenue and Videl Street. In this picture Jack is standing beside one of the original pieces of fire fighting equipment acquired from War Assets Disposal Branch. 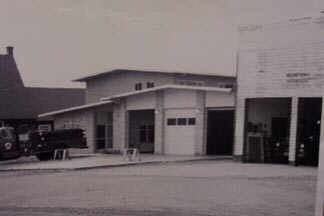 In 1942, Kelman's Garage at the corner of Washington Avenue and Vidal Street served as the White Rock fire hall. The need for an independent facility resulted in the purchase of the property next to Kelman's garage. A 20 foot by 30 foot building was eventually erected with small living quarters above and a 35 foot hose tower with siren. Within a decade, this hall had become obsolete. When the White Rock/Sunnyside Fire Hall at Johnston and North Bluff Roads (152nd and 16th Avenue) became operational, the original hall was closed down in June 1953 and sold. Proceeds of the sale were used to extend the new hall by two bays, which centralized the areas fire fighting equipment. On January 1st, 1959 the White Rock/Sunnyside Fire Hall was turned over to the City of White Rock. Bill Pollard had been a volunteer fire fighter as early as the 1940s. He was appointed a Chief in 1952 and served in that capacity until 1963. Here Bill Pollard is sitting on one of the White Rock Fire Trucks acquired from the Federal Government as war surplus material. During World War II, the federal government established Air Raid Precaution Units, [A.R.P.] for civil defense purposes across Canada. One such unit was Surrey Air Raid Patrol, headed by G. A. Hooser. Air Raid Wardens were given buckets of sand and shovels with which to extinguish incendiary fires, that were expected to occur with the Japanese dropping incendiary leaflets from their aircraft. No air raids took place in Canadian airspace during the War. As a result of the A. R. P. the Municipality of Surrey received much needed equipment when the A.R.P. was disbanded after the War, and new fire halls sprang up throughout Surrey; South Westminster, Sullivan, Crescent Beach, Port Kells and Hazelmere. The Royal Canadian Air Force Crash Wagons were purchased by Surrey Fire Department on February 13, 1945. They were for use in the districts of Cloverdale, White Rock and Port Kells. The trucks were 3 ton Fords with V8 motors, with six wheel drive, 2 in the front and 4 single tandem on the back. The drive system was Marmon–Harrington. These trucks were in Calgary and McLeod Alberta as war surplus. A 1,000 gallon tank was added as local hydrants were lacking. It is interesting to note that in the 1950s Surrey Volunteer Fire Chiefs and the paid fire fighters, were sworn in as Forest Fire Prevention Officers under the jurisdiction of the British Columbia Forest Service. The reason for this was that the Forest Service had total control for issuing burning permits and fighting Wild land fires. At a later date Surrey Fire Department Officers were appointed as Provincial Assistant Fire Marshals and eventually, Local Assistant Fire Commissioners. Until 1957, there was no efficient system of addresses in Surrey. In the closely–knit community of earlier years fires were located by the name of the property owners. 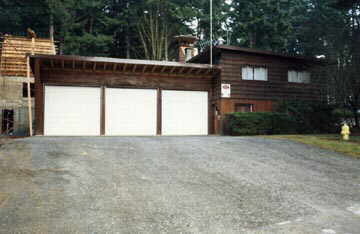 With the construction of the Trans–Canada Highway and removal of tolls on Pattullo Bridge, the population of Surrey increased steadily and problems surfaced in locating fires by individual property owners names, this problem was recognized earlier, when in 1948, Canada Post had urged Surrey Council to adopt an address system. In 1957, the Municipality joined with the rest of British Columbia's municipalities in adopting a grid system of streets and addresses. After fire fighters and residents learned the new system, emergency personnel were able to be dispatched precisely to specific addresses. In 1958, Surrey amalgamated all its fire districts into one fire department, at which time the various fire halls were given numbers instead of district names. 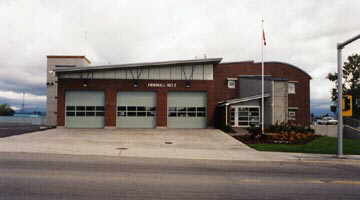 Individual pride was a factor to this change, many of the fire halls shunned the number system and preferred the continued use of their names, for example:– Port Kells Volunteer Fire Department, Hall 7. As a result of this amalgamation Ray Feather was put in charge of all fire districts in Surrey. This new system was further endorsed when shortly thereafter the Municipality abolished the Ward System of political representation. The members of Surrey Fire Department have always been pioneers in new developments and initiatives. Mouth to Mouth Resuscitation was tried in Surrey when other agencies,(except for Richmond Fire Services), were skeptical about the procedure. The first female fire fighters on a Municipal Fire Department in B.C. were Jean Turley and Helen Beaton of Johnston Heights, Fire Hall 6, when they came on staff in 1960. Surrey has the largest composite Fire Department in Canada, with 351 full time members, 5 support staff and 270 volunteer fire fighters (as of 2005). Surrey ranks high among the best trained fire departments in the country. Local Fire fighters are in demand as trainers throughout the Province of British Columbia, Western Canada, the Justice Institute of BC Fire Academy, and also in Saudi Arabia. In 1998 Surrey Fire Captain Ed Wells, embarked on a one year fire staff exchange program with Australian Fire Services. The professional rank and file members of Surrey Fire Department are some of the most respected and recognized union brethren in North America. Surrey Captain Lorne West is the current 6thDistrict, Vice President of the International Association of Fire Fighters. Likewise the volunteer fire fighters of Surrey were instrumental in developing the Volunteer Fire Fighters Association of BC, Wes Gillis of Hall 9 and Alan Clegg of Hall 8 were organizers and first executive members of that Association. Both the professional and volunteer members of Surrey Fire Department have been involved with numerous initiatives. The first person to be in charge of Surrey municipal fire services was Lambert Burton, appointed on Feb. 17, 1947. He was an Inspector with the Surrey Building Department, however, he was also an oil burner inspector and as such was in charge of overseeing the operation of the fire department. In 1952, Ray C. Feather, was appointed to the position as Surrey's first full-time Fire Chief. He was also working for the Municipality of Surrey, as Manager of the Municipal Stockroom, prior to his appointment. In 1972, Chief Feather retired and W. Allan Cleaver was appointed Fire Chief. Chief Cleaver came up through the ranks. He was a volunteer fire fighter at South Westminster Fire Hall 1 and was also the first Training Officer for Surrey Fire Department. In 1986, Chief Cleaver retired and Howard G. Seter became Fire Chief. Chief Seter also came up through the ranks, beginning as a volunteer at South Westminster Fire Hall 1. In 1996, Chief Seter retired and James G. Bale became Fire Chief. Chief Bale also came up through the ranks, beginning as a volunteer at North Central Surrey Volunteer Fire Department, Hall 4. Prior to joining the fire department Jim Bale was the Drum Major for the North Central Surrey Junior Firemen's Band, (Canadian Legion Jr. Band). Chief Bale left the Fire Service in April 2001 and Len Garis was appointed Fire Chief. Chief Garis was promoted from a position of Assistant Fire Chief on Surrey Fire Department. Chief Garis came to Surrey Fire Department from the Pitt Meadows Fire Department where he was Fire Chief. He also served with of the Justice Institute of British Columbia, Fire Services Branch. Chief Garis grew up in Cedar Hills / West Whalley area of North Surrey and would often visit at Fire Hall 2 during his journeys to and from school at West Whalley. Under the Ward System of Municipal Government each Ward had to pass their own by–laws to raise funds for improvements. Fire brigades were considered improvements. Prior to money by–laws development of fire brigades was by personal subscription of funds by residents, or donations from fund raising dances, bake sales, etc. Here are some of the early money by-laws for Surrey Fire Department. * By–laws for the purchase of War surplus Crash Wagons. The following by–laws are also recorded, although the money amounts have not been checked. ** This by–law did not pass. If it had passed then Hall #10 would have been located in the area of Scott Road rather than 72 Avenue and King George Highway. By–law #1652 was a Consolidation of Fire Districts Referendum By–law – held in 1958. The first recorded, [authenticated], fire equipment used in Surrey was in Cloverdale. They were two tanks of forty gallon capacity each. In addition to a hose reel and some extension ladders. The first real or factory built fire truck was a 1922 White. This truck was a used Chemical Wagon (Truck) purchased in 1940 by the Cloverdale Fire Brigade, from the City of Vancouver, for $325. 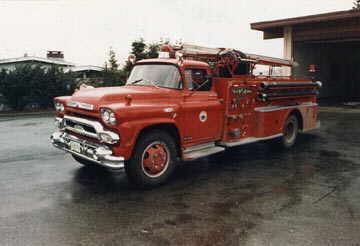 This truck is now owned and being restored by the Surrey Firefighters Association, Local 1271. When World War II ended, the Municipality of Surrey purchased the three Air Force Crash Wagons from the War Assets Commission. The fire department also received four portable trailer pumps from the Air Raid Precaution [A.R.P.]. One of these Crash Wagons is located at the City of Surrey Museum. Over the years, several cars and small trucks were modified to carry water, hose and other fire fighting equipment. The equipment was distributed among the eight established fire districts in Surrey. When World War II ended, the Municipality of Surrey purchased four portable trailer pumps from the Air Raid Precaution [A.R.P.]. One of these Trailer Pumps is presently located at the City of Surrey Museum. 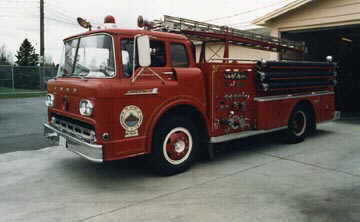 By the 1960s, Surrey began manufacturing its own fire pumpers at the Municipal Work Yard. Eleven of these trucks were manufactured and the last one produced is housed at the Surrey Museum. This truck is a International, 1,500 gpm, Hale single–stage pump, triple combination pump, and the truck is painted fire engine red. The cost saving in producing these trucks, over the purchase of factory manufactured units, was approximately $10,000. In those days a factory unit was priced around $30,000, therefore, for every two constructed there was a saving sufficient to build a third. The truck on the left is a 1958 Pierre Thibault pumper that was used at Hall 2(West Whalley). The truck on the right is a 1960s Ford cab over head pumper from Hall 4(North Central Surrey). 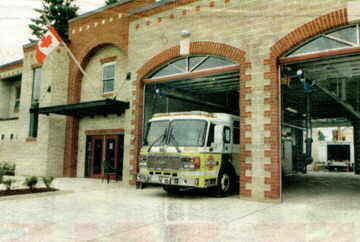 The truck on the left is a 1992 pumper stationed at Hall 6(Johnson Heights). 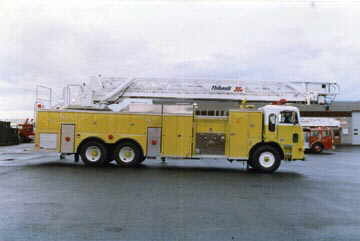 The ladder truck is a 1989 – 30 metre Pierre Thibault Ladder Truck. Surrey continues to upgrade its fire fighting equipment. 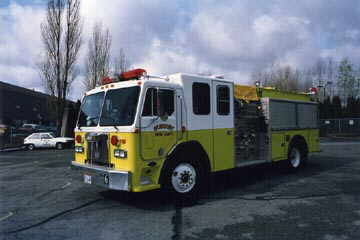 Here is a 2003 model pumper. Early personal protective equipment was very limited. 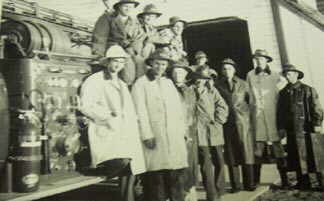 Most fire fighters arriving at the fire scene wore everyday type clothing, full–length rubber coats and army helmets were added during the War by the A.R.P. Early fire fighters did not have breathing apparatus. The act of inhaling toxic smoke and fumes, gave these individuals the moniker of Smoke eaters. The installation of fire hydrants, beginning in 1954, has increased the availability of water and reduced the need for pumps to draft water from wells, rivers, creeks and ditches. The first fire hydrant [Hyd. 1] is located at the south end of Pattullo Bridge on the east side of King George Highway. Surrey's first Fire Boat, named THE SURREY GUARDIAN was purchased in 1968, to fight fires along the Fraser River. The Captains mastering this vessel were; John Menunzio, Rudy Brieter and Bob McNabb. This boat was sold in 1972 in favour of a Ladder truck. Communications have also become more effective over the years. 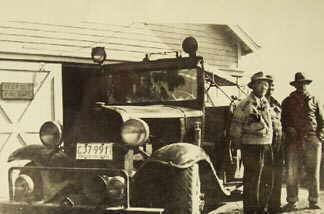 The first siren was purchased in 1938, by Cloverdale Fire Brigade. The first radio equipment was purchased in 1956. Stationary monitors were added during the 1960s and individual pagers were put into service during the 1980s. Today, Surrey Fire Department is the dispatch centre for White Rock, Langley City and Township, Pitt Meadows, Maple Ridge and Port Coquitlam fire Departments. Prior to February 1st 1966, Surrey Fire Department did not have a paid Training Officer, it was on that date Captain Al Cleaver became Surrey's first Training Officer. He held the position until April 1971, when Captain Lorne Pearson became Training Officer. At that time there were twelve fire halls in Surrey, four had paid staff and volunteers, the other eight halls were totally staffed with volunteers. Each hall trained on a regular, but individual basis. Captain Cleaver developed a schedule that encompassed the twelve fire halls being instructed in a standard manner. The result was that four different halls received training Monday to Thursday evenings and two were trained on Sunday mornings. The remaining six halls received duplicate training the following week and all paid staff were trained on Monday to Thursday mornings. Instruction was based on IFSTA Oklahoma State University criteria. In addition to training fire fighting personnel, a multitude of other duties were carried out by the Training Officers, such being personal development, developing pre–entrance exams, establishing a training manual, assisting volunteer halls in budget preparation, recruit training, developing public demonstrations, creating fire hall inventories, lecturing and training nurses and private industry staff, talking to school children and attending major fires to observe operations. A corollary to all this was; perform anything else the Fire Chief thought of! A heavy mandate of high performance was established early within the Surrey Fire Department Training Branch and it is still carried out today with pride, as the acceptable standard. The first fire protection by–law, [1012 (1950)], for Surrey Fire Department was passed in 1950, this was a by–law for the administration and control of the fire department, it also contained clauses to enforce the control of burning and other fire prevention related concerns. Prior to the passing of By–law 1021, (1950), concerns related to life safety and fire prevention were at the jurisdiction of the Provincial Fire Marshall, burning permits were the responsibility of the B.C. Forest Service. Municipal Fire Marshall Ray Feather was appointed in 1952. His title was Fire Inspection Officer and Coordinating Officer for Surrey Fire Department. Feather was the only Fire Inspector until April 1, 1955, when Glen Orville Worden was hired. A third Inspector was hired on July 20, 1956, in the person of Cecil Giles Clake. Unfortunately, most of their time was occupied by oil burner inspections, writing fire permits, doing fire reports and miscellaneous other responsibilities incumbent to the operation and function of a developing fire department. In 1990 Chief Menun retired and Peter Sly was hired as Chief F.P.O. Chief Sly was a member of the City of Vancouver Fire Prevention Branch before coming to Surrey, even though he worked for the City of Vancouver, he was a lifetime resident of Surrey. Chief Sly retired on May 31st 1998 and John Strandt was promoted to Chief Fire Prevention Officer. Chief Strandt left the Surrey Fire Service on August 27th 2003 and now Chief Gordon Anderson is in charge of the Fire Prevention Branch. Chief Anderson was hired as a fire fighter on October 12, 1976 and worked his way through the fire fighting ranks into the Fire Prevention Branch. Beginning in the 1980s and continuing until the new Millennium, Surrey developed a successful Public Education Branch, under the leadership of Public Education Officer Al Lonneberg. Al was a volunteer fire fighter at Hall #10 and was hired as a fulltime fire fighter on June 7th 1972. The branch grew and functioned well with the use of numerous summer students, during its two decades of operation. Many innovative fire safety educational aids were created, such as the famous SIR–E–BEAVER mascot, a Sir–E–Beaver talking robot and many customized Surrey Fire Department devices, teaching aids and brochures, directed to teaching children fire safety in Surrey schools. On December 14th 1989, Kent Jones was hired as a Public Educator, to supplement the efforts in the Pub Ed. Branch. Ken was a volunteer fire fighter at Langley City for many years prior to his employment in Surrey. Ken became Public Education Officer when Al Lonneberg retired in 1993. Another Public Educator, Michelle Jackson, was hired when Al Lonneberg retired. Ken retired on September 30th 2003. Michelle left the Surrey Fire Service, in favour of a job with Abbotsford Fire Services on January 31st 2004. Captain Peter Choy assumed leadership of the Public Education programs on January 8th 2004 and in the new era, fire fighters, under the direction of fire fighter Tom Stiebel, administer an Adopt a School Program. The most costly fire loss in Surrey was the Fraser Surrey Docks fire in 1991, the loss at that fire was $25,000,000, the fire burned for one week. Was originally known as South Westminster Volunteer Fire Department. The department was formed on January 2nd 1946 and a fire hall was built at the corner of Scott Road and Pattullo Road, near the present Scott road Skytrain Station. (Pattullo Road no longer exists). 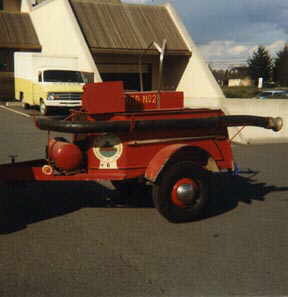 Prior to 1946, a 250 gpm portable A.R.P. trailer pump was stored in a shed at Valley Lumber Yards (Beaver/Revy Lumber), across Scott Road from the fire hall location. This trailer pump was towed to fires by John Pearson's personal 1935 Chevrolet 1/2–ton pick–up. He was the local A.R.P. Warden at the time. This was the first municipal fire hall built north of Sullivan and West of King George Highway. Hall 1 was built by volunteers, with lumber donated by local sawmills and lumber yards, the construction method was 2x4-inch fir, horizontal crib wall style. The hose tower was of standard, stud construction and on the top was a World War II, surplus air raid siren. 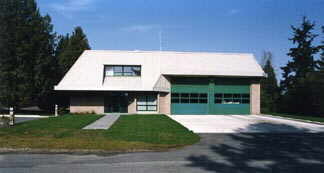 Total cost for construction of the two-bay Fire Hall 1 was $2,350. The picture on the left is the first South Westminster Fire Hall which was located near the present Skytrain Station. 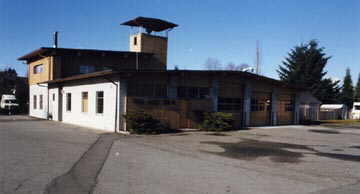 It operated from 1946 until the present Fire Hall 1, at 8767 132 Street, was opened on June 11, 1977. The first Volunteer Fire Chief at South Westminster Volunteer Fire Department was John Pearson, the Deputy Chief was Harry Brown. The second Chief was Jim Cook. Third was Jack Fisher, who was removed for cause in 1949. Chief James L. Cook was then elected Volunteer Chief for the second time. 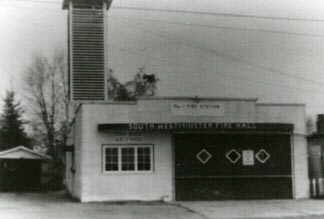 The original South Westminster Fire Hall closed in 1961. In December 1958, Captain John Menunzio and his family moved into Hall 2 and remained living there until 1970. Captain Menunzio was also the first and only Volunteer Chief at Fire Hall 2. The hall was constructed to protect the West Whalley area, St. Helen's Park, Cedar Hills and Royal Heights. When Fire Hall 1 closed in 1961, Hall 2 acquired protection responsibilities for all South Westminster and Bridgeview as well. The fire hall was officially opened on October 24th 1959. Initially the hall was known as South Westminster Fire Hall 2. 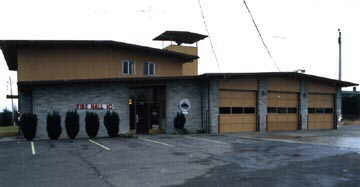 The original fire hall 2 was replaced by the present Fire Hall 2 in 1999, and the old hall demolished. 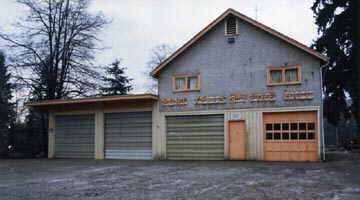 This fire hall was originally located in Port Mann and owned by the C.N.R. In 1958 the building was moved from Port Mann to 9865 Sandell Road (128 Street), the Volunteer Chief at this location was George Cruickshank, who was also a Fire Committee member for Fire Hall 1. In 1959 the building was again moved, this time to 11659 – 96 Avenue, where Jimmy Miller became the first Volunteer Fire Chief. Some of the other earlier volunteer chiefs at Fire Hall 3, in sequential order were Dave Shenton, Doug Proctor, Gordon Mason, Vic Green, Dean Colthorp and Ray Menagh. 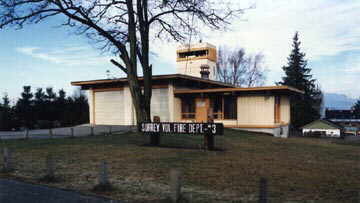 In 1965 the present Fire Hall 3 was constructed and the twice moved original structure was relegated to the back yard. Was known as North Central Surrey Volunteer Fire Department. This is the first Fire Hall 4, North Central Surrey Volunteer Fire Hall, with its first trucks and crew. 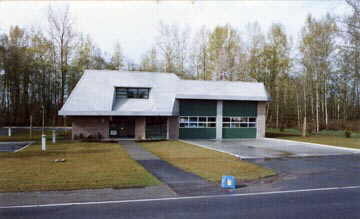 It was replaced with this new North Central Surrey fire hall which was opened in 1959. The first fire hall was constructed on Hjorth Road at 139 Street and was officially opened on April 9th 1957. Prior to the fire hall being constructed by volunteers, the fire truck was housed in a barn owned by Harold Vernon alongside Forsyth Road (139 Street) near 104 Avenue. The first Volunteer Chief was Jim Brooks. In 1959, a new fire hall was built at 14586 108 Avenue. Fran L. Myttenar was hired as a paid Captain, Volunteer Chief on April 5th 1958. When the new fire hall was opened in 1959, Myttenar and his family moved into the fire hall. On June 14th 1964, Myttenar resigned after being charged with arson, Harold Pinder then became Acting Captain and Volunteer Chief, when Myttenar was found guilty. Lorne Pearson was promoted to Captain and Volunteer Chief at Fire Hall 4. On December 1st 1964, Pearson and his family moved into the fire hall and lived there until 1971. This hall was founded in 1962 and was a satellite station to Hall 4, it was developed because of the construction of Highway 1,(Hwy. 401) which caused the northeast section of Surrey to be severed by the highway. Hall 5 was originally located at 168 Street and 104 Avenue. In 1991 a new fire hall was constructed at 176th Street and 100 Avenue. The first Volunteer Chief at Fire Hall # 5 was Glen Ardiel, followed by Henry Koelling, Gordon McNiell, Len Rushton, Jim MacPherson, Nobel Larsen and finally Glen Whitter. 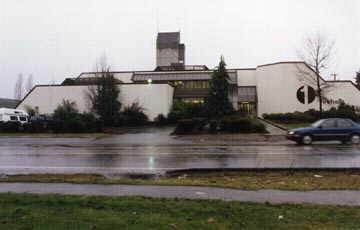 In later years the hall was referred to as Fraser Heights District Fire Department. Paid staff went into Hall 5 in 1989. 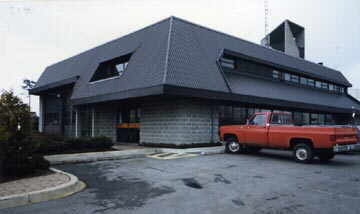 This fire hall was a satellite to Sullivan Fire Hall 9 and was originally known as Sullivan's Auxiliary Fire Service, Johnston Heights Branch. It was founded on March 24th 1952. 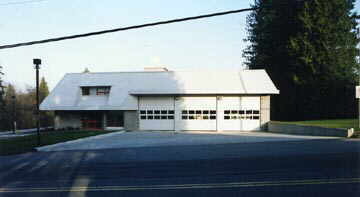 When Sullivan built a new fire hall in the early 1950s, their old fire hall lumber was used to build a fire hall 6 on the southeast corner of 152 Street and Trans Canada Highway [Fraser Hwy] on property donated by a Mr. Stockwell. (location of Evergreen Mall). Fire Hall 6 was eventually moved to Municipal Property at 9049 152 Street(location of the present Fire Hall 6). Two new Fire Halls have been constructed at this site. The second and current hall has been renovated three times. It was originally opened on April 29th 1961. The first Volunteer Fire Chief at Hall 6 was Elgin Wolfe, elected on August 14th 1952, second was Herb Burgess, then Charlie Matthews, Wally Snooks, Bob Turley and Sid Stokes. Originally known as Port Kells Volunteer Fire Department. It was founded in 1940, but did not become a functional fire department until 1945 when the Fire Hall was constructed, that is the section on the west side of today's hall (the two story with the gable roof). It was constructed on the site of the original Port Kells Church, which was moved east on 88 Avenue to its present location. The addition of two truck bays on the east side was completed in the 1970s. The first Volunteer Fire Chief at Hall 7 was Alf Watson, the second was Everett Bulman and the third was his son Jim Bullman. Fire Hall 7 is the only Surrey Fire Hall to have three generations of volunteer fire fighters responding at the same time, they were Grandfather Everett, Son Jim and Grandson Clint Bulman. Was originally known as Cloverdale Volunteer Fire Brigade. The first Fire Hall was built in 1930. This was Surrey's first fire hall. The Fire Hall was replaced in 1947 and has been renovated several times since then. It has always been located at 17572 – 57th Avenue. 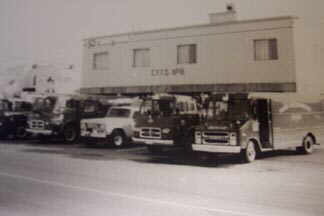 The picture on the left is Cloverdale's first Fire Hall with a truck and trailer pumper. 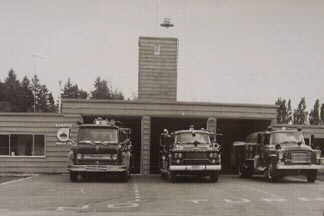 On the right is Cloverdale Fire Hall 8 pictured in 1975. The third photo is the current Cloverdale Fire Hall 8. All the halls have been located on the same site. The first Volunteer Fire Chief was Charles Hamre, the second his brother Ed Hamre, Bruno Zappone(who still resides in Cloverdale) was the third Volunteer Chief and Jim Urquhart was the fourth. 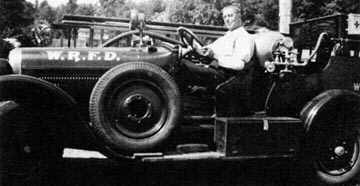 (Jim Urquhart was in charge of designing and building the Surrey manufactured fire trucks mentioned earlier. 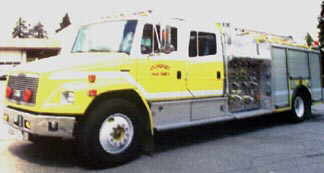 Surrey Professional Fire Fighters Pioneer Association President, Graham Symonds, was also instrumental in building these trucks. Graham was also a Volunteer Chief at Fire Hall 8. The name given to this fire brigade at conception was Sullivan Auxiliary Fire Service 5, it was founded on May 20th 1944, as an A.R.P. brigade. Their first Fire Hall was constructed at 6272 152nd Street. A second hall was constructed, beginning in 1955 and completed in 1958, at the same location. This was built under the direction of Wes Gillis by the Hall 9 volunteer fire fighters. The first Volunteer Fire Chief at Hall 9 was Tom Johnston, second was A. Wes Gillis, some others in succession, were Merle Hiltz, Ron Armitage, Dave Mortenson and Bill Mc Macnab and Ken Dahl. 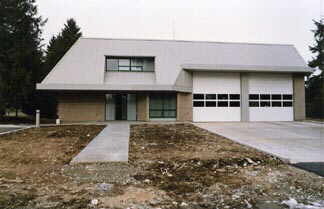 In 1997 a new Fire Hall 9 was constructed alongside 64th Avenue at 14901. 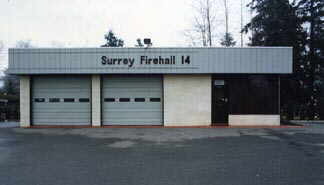 This location is also the Central Training Facility for Surrey Fire Department and the main Mechanical Service Garage. The first Mechanic for Surrey Fire Department was Gordon Marshall, the second Andy McLay and the third is Assistant to the Fire Chief, Mechanic Gordon Wilson. Old time Sullivan firefighters took time out in the late 1940s for Wes Gillis to take a picture of them beside their pumper truck. The picture shows the driver, Jim Sullivan; standing, Henry Sullivan and Wilson Dunn; second row, J. Bell; seated, Jack Hicks, Gordon Vincent, Tom Johnston and Foss Hoy. Kneeling are Elmar Lyle, Alf Anhorn, Jim Johnston and Bill Jones. Missing from the picture are volunteer firemen Gillis, W. Hamilton, W. Tarves, W. Hyndman and Ivor Gustafson. 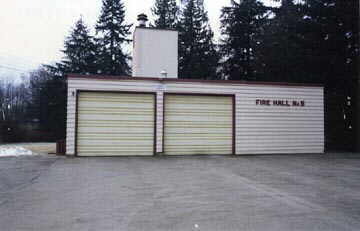 The name given this hall when it was formed in 1954 was, West Central Surrey Volunteer Fire Department. The hall is located at 13570 – 72 Avenue,(Newton). The picture on the left shows the first two fire halls in Newton. In this picture the new hall was not yet open. 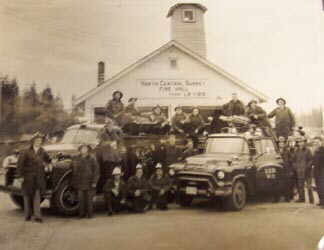 The second picture shows the first fire hall crew in Newton in 1956. The 3rd picture is the Newton Fire Hall 10 which was replaced in June 2007. The first two fire halls were located at this location. The property was sold to Surrey by Lew Jack at a bargain price. His son Art donated the Fire Hall, which was originally his service station, located adjacent to the site. The first and only Volunteer Fire Chief was Art Jack. Art was hired full time as a Captain on June 1st 1959 and served his full career at Hall 10, until his retirement on September 30th 1978. Fire engines roll into Newton's new fire hall 10. It is located at 7278 132nd Street, west of the old fire hall. The old hall was right on the corner of 72nd Avenue and King George Highway and the street was very busy. Traffic was often backed up along 72nd blocking the hall entrance. The new hall was officially opened Tuesday, June 26, 2007. 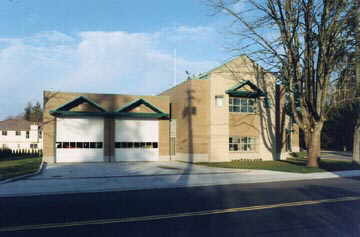 Newton firefighters began moving into their new hall on 132nd Street on Monday June 18, 2007. The new hall is located at 7278 – 132nd Street. It replaces the old Hall 10, 45 years old and showing its age. The $4.5 million building is better located to cover Newton and gives better access to fire crews trying to get in and out. The hall features among other things three drive-through bays for fire trucks, a hose tower, training facilities and a brass fireman's pole. A time capsule loaded with firefighter memorabilia and letters from city officials has been buried under the floor where the trucks will park and a sculpture bearing a working, hand-cranked siren decorates the front of the building. In addition to the usual firefighting services, the new hall will be home to a CPR training program and the department's neighbourhood emergency preparedness program. Was dedicated on January 18th 1991. When this hall opened it was manned with full time staff. It is located at 12863 – 60 Avenue. Was originally was known as Crescent Beach Volunteer Fire Department, it was founded in 1947 and was located at 12318 Beecher Road, Crescent Beach. The first Volunteer Fire Chief for this department was Douglas Greggor. In 1948, A. Goddyn was appointed Volunteer Chief and in 1949 Bill Gardner, he was in charge when the fire hall was built on Beecher Road. In 1951, a tragic house fire occurred in Crescent Beach and volunteer fire fighter Derek Brown lost his wife and two children to the flames. Derek later became a volunteer fire fighter at Hall 2. Immediately after this tragic blaze Collin McFayden became Volunteer Chief. In 1954 Aubrey Leonard Stevens became Volunteer Fire Chief and during his era the Fire Hall at 2610 128 Street was built by the volunteer fire fighters. Was originally known as Sunnyside Fire Department, it was first located at 15310 24th Avenue (where Semiahmoo House is today). This fire Hall was built in 1958 after White Rock seceded. 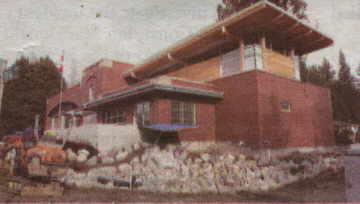 Prior to this the Fire Hall was located on the northwest corner of 16th Avenue and 152 Street, north of where the Bread Garden is located today. The Captain and Volunteer Fire Chief at this hall was Harold Barge. Harold and his family lived in the Fire Hall when it first opened. 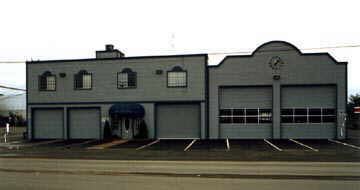 The present Fire Hall 13 at 15155 – 18th Avenue was built in 1982. Originally known as Hazelmere Volunteer Fire Department, was founded in 1946 and was located on Pacific Highway (Hwy. #15), one block south of 16th Avenue on the west side of the highway. When the fire department began, fire fighting equipment was stored in George Homefield's barn. George was the first Volunteer Fire Chief at the hall. Stan Shepherd also served as Volunteer Chief, for many years after George. In the 1980s, the Fire Hall caught fire and was damage beyond repair, today's fire hall at 2016 176 Street (Hwy. 15) was a vacant service station, it was purchased and converted into a fire hall. 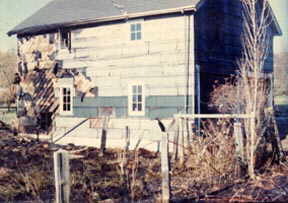 The picture on the left is Hazelmere Fire Hall after the fire in the 1980s. On the right is the current Hall 14 which was originally a service station but was converted into a fire hall. Memories of former Hall's Prairie students: George Homefeld and Stan Shepherd, original Hazelmere volunteer firemen. During World War II, Fire Warden, Mr. Hooser, helped to establish a Fire Brigade in the Hazelmere Valley. In 1945, five men, Mr. Ernest Scott, Mr. William Scott, Mr. Oliver Jones, Mr. S.J. (Stan) Shepherd and Mr. George Homfeld, each put up $500 toward the purchase of a fire truck. They were later reimbursed by the Municipality of Surrey. Mr. Hooser obtained fire hoses from war surplus and new couplings were bought to fit the fire truck. 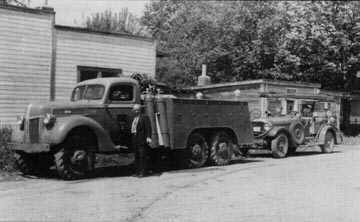 At that time, the fire truck was stored at the farm of Ted Kuhn (we called it the "Old Dunne Place" and later the "A. Westerly Farm". The old Air Raid Siren, mounted on the Hazelmere Store, called the volunteers to a fire. Local men volunteered their services. The first firemen were Stan Shepherd, Gordon Thompson, Claire Arland and George Homfeld. Over the years many more volunteers joined. 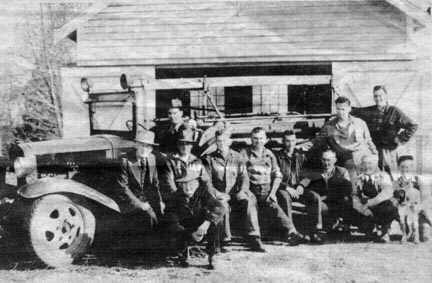 The first Fire Hall was built in 1947 at the foot of the Pacific Highway hill on land donated by Ray Shepherd, (Stan Shepherd's father). The Air Raid Siren was then moved from the Hazelmere Store to that building. George Homfeld, who was the first Fire Chief, could not always hear the siren from his home once it had been moved to the new hall, so he gave up the leadership, but continued to serve as a fireman for many years. Mr. Stan Shepherd served as Fire Chief for about 30 years. The first Fire Hall was burned down in 1978 by a grass fire started on the adjacent farm. The fire truck was saved, but a lot of early records were destroyed in that fire of the building where they also conducted meetings and training. After this blaze, the fire department was moved to its present location at 176th Street and 20th Avenue (which was previously a gas station). Local men still volunteer and serve our community at Fire Hall 14. Memories of Hall's Prairie: Elementary School Cookbook. Buchanan Printing, White Rock BC 1996 pp169-170. On January 28, 2011, Surrey's new Hazelmere fire hall opened and is now staffed by career firefighters. The Hall at 2016 – 176th Street will be a composite hall meaning paid–on–call firefighters, who previously operated out of the hall, will continue to supplement the career force. The POC Department served the Hazelmere Valley for the preceding 65 years but will continue to supplement the career firefighters. The volunteers have provided a great service for the Hazelmere community and will continue to do so. 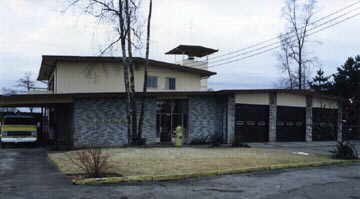 Dedicated on May 20th 1992, this Fire Hall is located at 18916 – 64th Avenue. When this hall opened it was staffed with full time personnel. 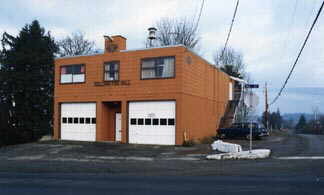 Dedicated on December 16th 1992, this fire Hall is located at 15329 32nd Avenue. This Fire Hall is manned by full time staff. It was the main fire department training centre when it opened, but now shares that responsibility with Fire Hall 9. 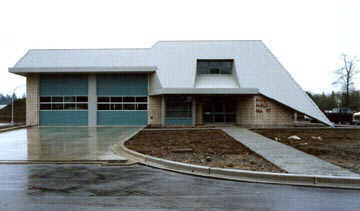 This Fire Hall became operational in 1995. It is located at 8091 164th Street. 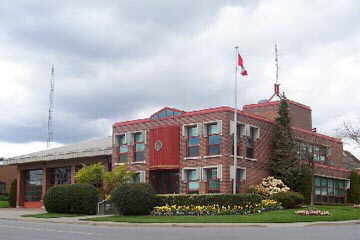 When the hall was built it was designed to house the RCMP, however the location did not function adequately and the hall annex became the pre-fire plan centre for Surrey Fire Department. Like Fire Halls 11 and 17 this hall is manned by full time staff. The Charter of Affiliation as members of an International Union was delivered to the International Association of Fire Fighters, Local No. 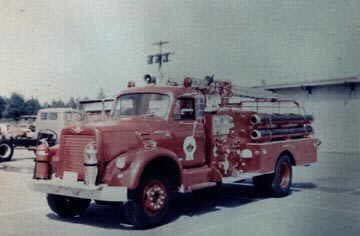 1271,(The White Rock Area Fire Fighters, Local 1271) on May 23rd 1957. Charter members included: A. Powell, Alfred Bard, G. W. Pollard, H. Barge, Charles E. Montgomery, James E. Cook, John Menunzio and Glen Orville Worden. To qualify for affiliation with the IAFF an area had to have seven members. In Surrey prior to May 1956, there were only five members, all employed at Surrey's White Rock–Sunnyside Fire Hall. When John Menunzio and James Cook were hired, full time, at South Westminster in May 1956, Surrey Fire Department met the required number, enabling an application for International Charter of Unionism. The Charter of Affiliation has eight names, the final name being Glen Orville Worden. He was employed as a Surrey Oil Burner Inspector and was a member of C.U.P.E # 402, however, a change in his job classification in the early months of 1957, allowed him to transfer to the fire service. When the Charter of Affiliation was delivered to Surrey A. Red Powell and Alf Bard volunteered to be Representatives for the Union until an election could be held in the fall. This was important because the newly Chartered Union Local had to immediately apply to the Labour Relations Board of B.C. for Certification. This was applied for on June 10th 1957, by A. Powell, however on June 14th 1957, the application was opposed by the Municipality of Surrey on the basis of White Rock being in the process of incorporating as a City. Nevertheless, Certification was granted on June 25th 1957, by W. H. Sands, Chairman of the Labour Relations Board. In September 1957, the first election of Officers for Local 1271 was held. John Menunzio was elected President and Lorne Pearson was elected Secretary/Treasurer. The Oath of Office was delivered at South Westminster Fire Hall, by Hector Wright, a Vancouver Fire Fighter who was Sixth District Vice President of the IAFF. The Surrey Professional Fire Fighters Pioneer Association was formed on July 24th 1992, when eight retired Surrey fire fighters met for a luncheon meeting in Yic's Restaurant at the corner of 104 Avenue and King George Highway in Whalley, Surrey. The members present at that meeting were; Alf Bard; Joe Clake; Ted Menun; Lorne Pearson; Denis Perry; Heinz Pflugrath; Alf Shephard and Graham Symonds. The first two named, Alf Bard and Joe Clake have passed away since that inaugural meeting. At the present time the Surrey Professional Fire Fighters Pioneer Association has 41 regular members and 3 honourary members, from our beginning until July 1998, three members have died and only few members retired from Surrey Fire Department have decided not to become members. Our Association meets four times a year, although if necessary our constitution and by laws is structured to allow us to meet more often.